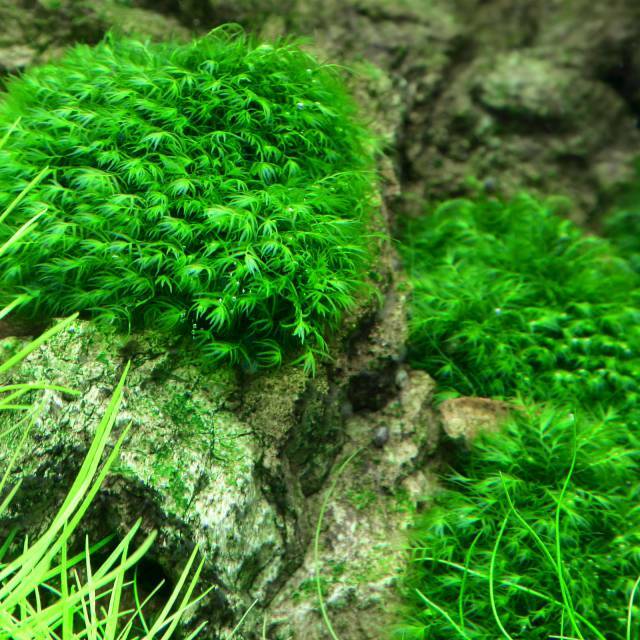 Mosses are a great way to add a natural touch to an aquascaping layout and aquarium. In addition, most species are easy to keep and fairly undemanding. We’ll introduce the topic of "mosses" a little more in detail now. Mosses, with their deep-green colour are a beautiful contrast to red or light-green stem plants or ground cover. They are usually combined with decorative materials such as stones or driftwood. 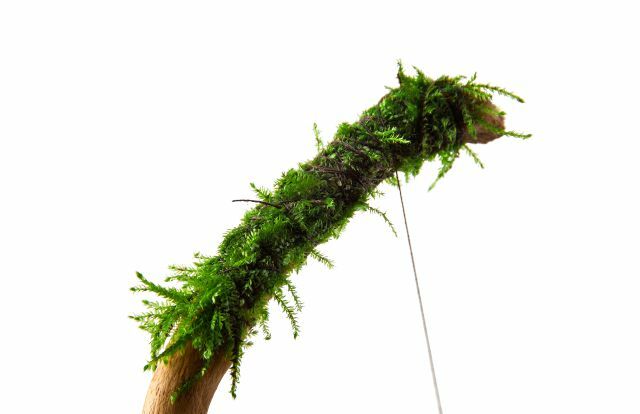 Mosses can just be wedged into gaps in the hardscape, tied to something or glued down, using suitable adhesive. 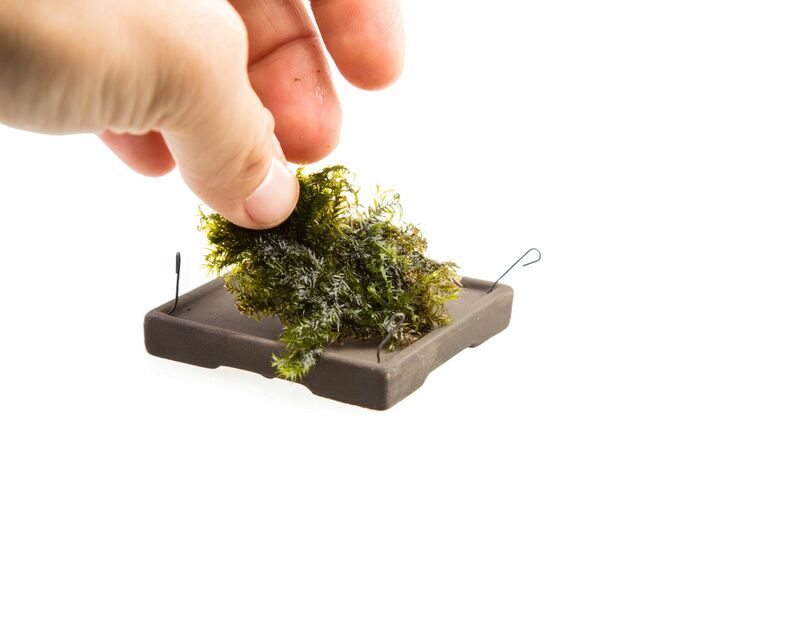 Tied to a slate or wedged into a pad, mosses can be used to easily create green areas. The moss then takes over the function of a ground cover. 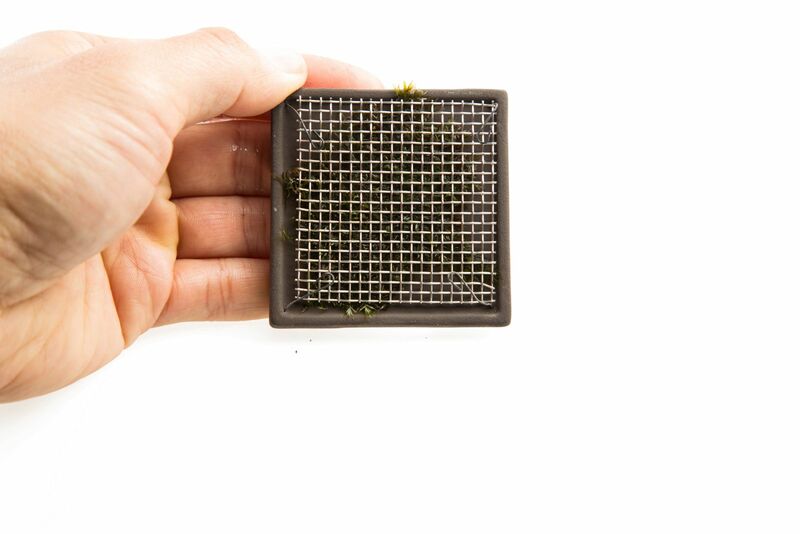 Detailed instructions for handling the pads are presented in the article "How to fix moss in the aquarium" in more detail. Moss is also ideal for greening aquarium back walls, since most species form adhesive organs (rhizoids) and grow over time. Mosses are also often used in the so-called drystart method. 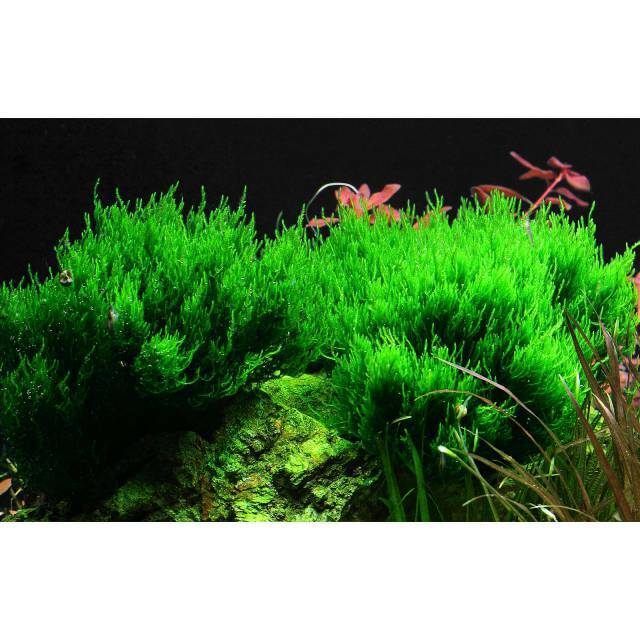 Mosses are very popular in aquaristics, but not just for optical reasons, but also biologically speaking, they have a lot of benefits. Its fine-fronded thicket provides good hiding places for very small animals, such as the offspring of fish or shrimp. Due to the large surface formed by mosses with their variety of leaves and branches, ideal colonization sites in form of of biofilms for microorganisms are offered. These serve, for example, the young animals of shrimp as a source of food. In addition, biofilms contain beneficial bacteria that degrade pollutants in the context of the nitrogen cycle and thus improve the quality of the water. As a spawning substrate, moss is very established in pisciculture. Riccardia belong to the liverwort species. There are several, but very similar species in aquaristics. Aquarists like to refer to them as coral moss or Mini-Pellia, too. Riccardia forms tiny, delicate ramifications and really comes into its own in nano aquariums. This liverwort grows to the substrate over time and then forms roundish pads. The growth rate is rather slow. An easy to keep liverwort that benefits from a little more light than needed and a good CO2 and nutrient supply. 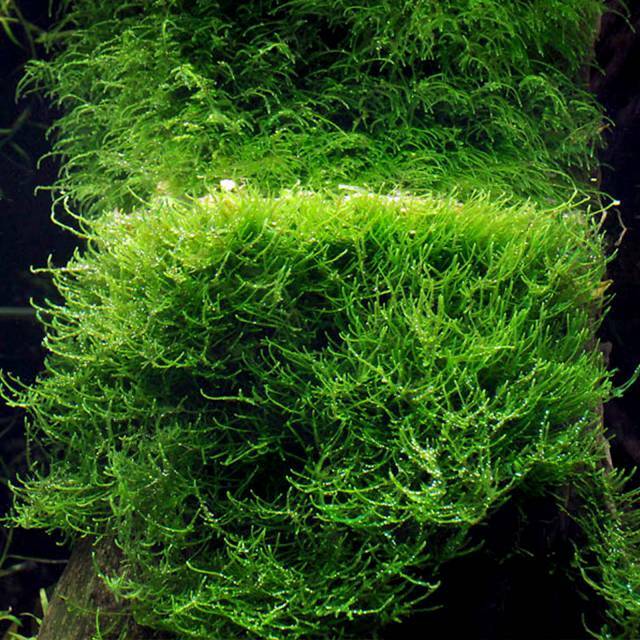 The Phoenix Moss differs greatly from conventional moss species. Its filigree shoots are very small and feathery in shape. With time, Fissidens forms beautiful, round pads and can grow onto things. Similar to Riccardia sp. it grows significantly faster and more healthy when being better supplied with nutrients. This moss is unique in appearance due to its upright, slightly spiral-shaped growth. It has not yet been determined to the species and so far is referred to as Taxiphyllum sp. "Flame Moss". Individual tufts can even be used as a solitary plant, as this moss does not have such a flat growing habit. Flame moss is an uncomplicated moss and also strikes root into the substrate. It has a nice, dark green colour. Christmas Moss has a typical growth habit for creeping mosses, with fir-like, elongated fronds. It may be Vesicularia montagnei from tropical Asia, or another very similar Vesicularia species. It strikes root into the substrate and then also grows in a horizontal direction. If enough light is available, the fronds remain densely branched and form a hanging growth. 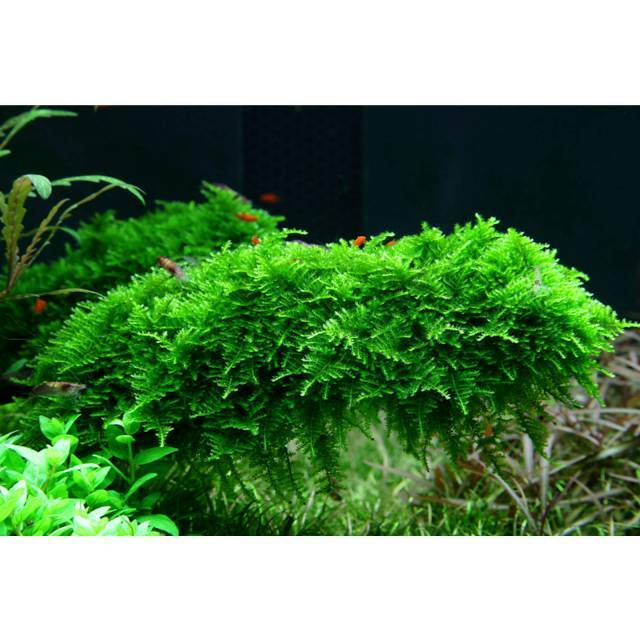 Botanically known as Taxiphyllum barbieri, Java Moss is probably the most popular moss for aquariums and very frugal in its keeping. Under good conditions, it is quite fast-growing for a moss and adheres well to decorative objects such as wood or stones. The Weeping Moss is native to East Asia and has the botanical name Vesicularia ferriei. It impresses with its strongly hanging growth and is therefore particularly suitable for greening individual root pieces. However, it does not grow on the ground and should therefore be tied down in the traditional way. As an in vitro plant or in landform, weeping moss has quite upright growing shoots. Underwater, however, it develops the typical hanging growth habit similar to a Weeping Willow. 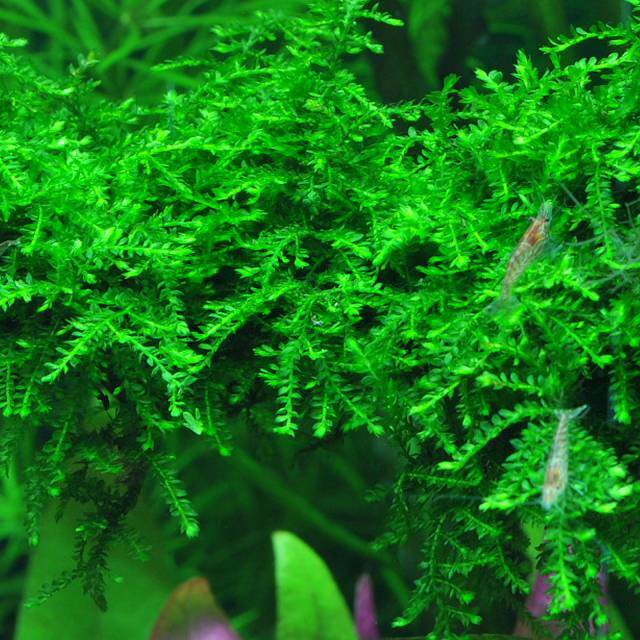 Riccia fluitans is more typically known as a floating plant. 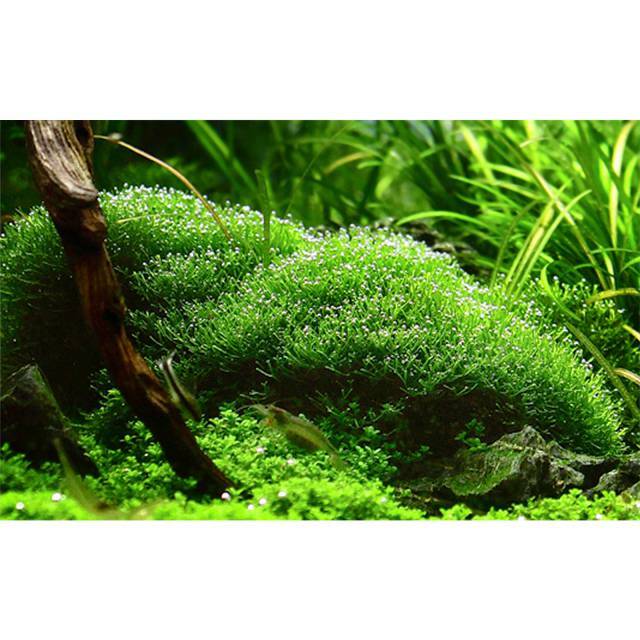 It was made popular for aquascaping by Takashi Amano, who used the moss as a groundcover. Crystalwort emits small bubbles when supplied with enough nutrients. All species of moss grow comparatively slowly. This reduces the care required. 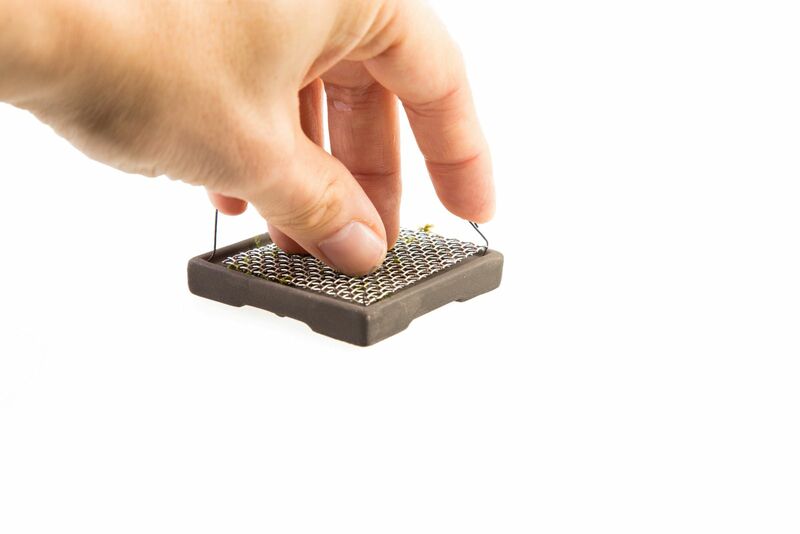 Nevertheless, pads should be thinned out over time, and (excessively) overgrown stones or wood need to be dug up. 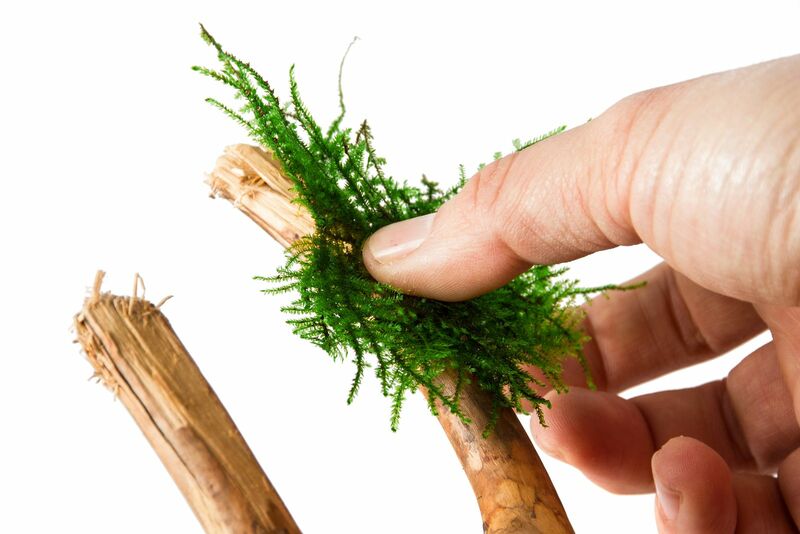 Use tweezers to gently pluck off excess moss. 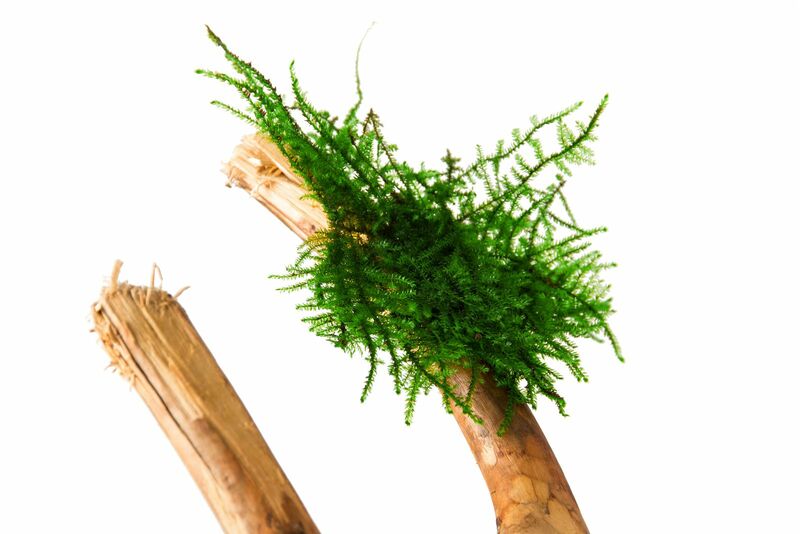 Trimming with the help of scissors may make sense from a design point of view, but often causes many tiny moss particles spreading uncontrollably in the water. They then often continue to grow elsewhere, which is not always desirable. 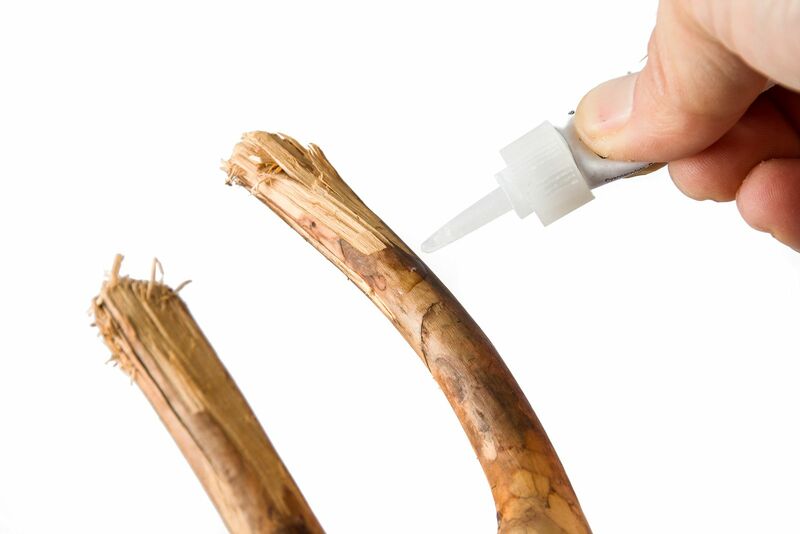 Remedy here is the interruption of the waterflow during trimming and the immediate syphoning or collection of the remnants. 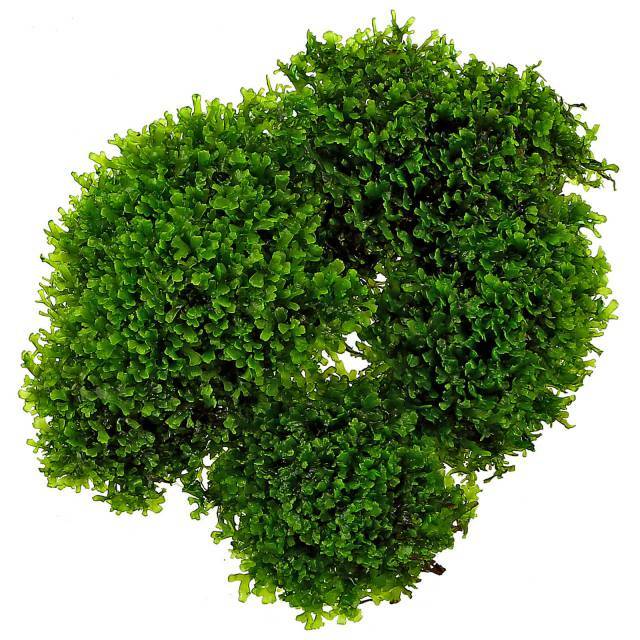 Even though most types of moss are rather frugal, sufficient lighting, a good supply with CO2 and appropriate liquid fertilization will support growth and vitality of the plants.